Local Projects - Spring Valley Rotary Schools To End Poverty (S.T.E.P) Inc. Since it's conception, in 2005, S.T.E.P. has supported the local backpack programs for students in the East Ramapo School System. 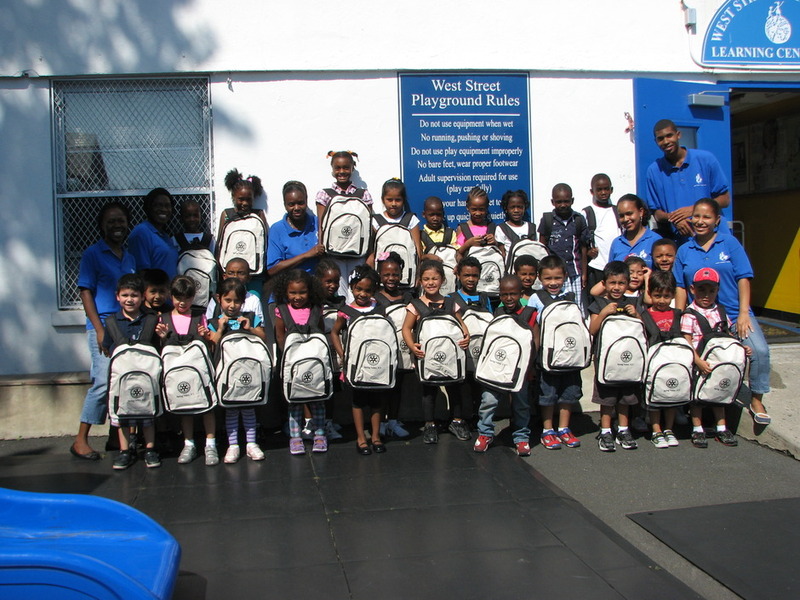 Pictured below is a backpack giveaway at the West Street Childcare Learning Center in Spring Valley, NY. As of 2010, S.T.E.P., has partnered with Orange and Rockland Utilities and the Rotary Club of Spring Valley to provided more than 5,856 dictionaries to 3rd graders in 5 elementary schools in the East Ramapo School District. From 2014 to 2018, S.T.E.P. has contributed funding towards the Summit Park Elementary School's Family Math Night. The goal of this event is to foster parental involvement and support in the learning of math concepts with their children. S.T.E.P. has funded the supplies necessary for each family to reinforce the learning activities at home. Thank you to all the Family Math Night S.T.E.P. volunteers!